After viewing the movie "Food Inc" I was thoroughly discussed by what I had just digested. This piece is about fast food consumption in the US and it's effect on our nation, it's effect on our world, from obesity to the demise of the rain forest. 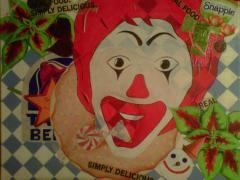 I started with a drawing of a donut and the leader of the fast food industry, McDonald's and then grew from that point.